My apologies to Nisse, Nisses, and their fans. 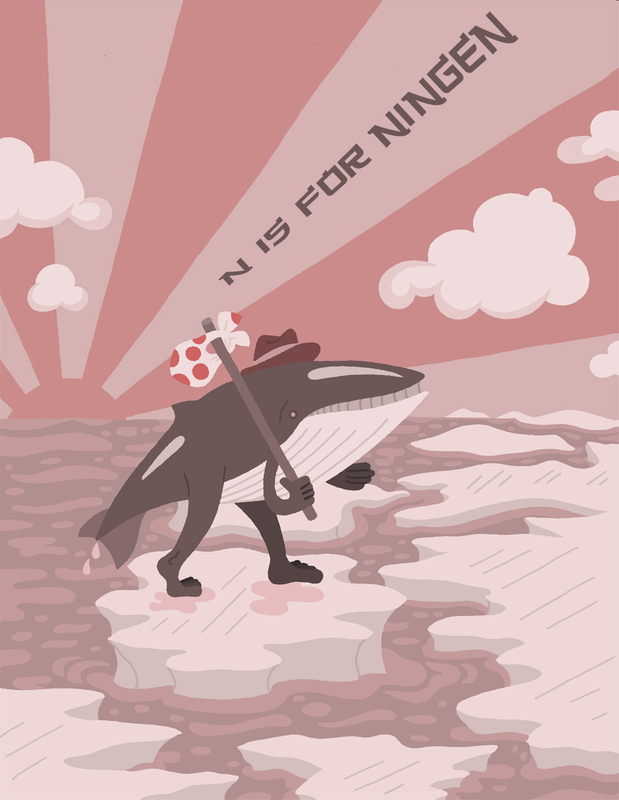 From the beginning I’d been intending to do “N is for Nisse,” but it just didn’t work out. The overlap with Elf was considerable, and there really wasn’t much else I could have done with E. Also, I discovered the Ningen. The Ningen is a badass monster. Sort of. It’s awesome in that it’s a mysterious mishmash of whale and man, sighted breaching in ice-choked Antarctic waters by Japanese whalers. It’s less awesome in that it’s pretty much just an internet legend. The disappointing thing about this beast is that there aren’t so much reports of it as there are reports of reports. This is the cryptid that all other cryptids must resent, as he’s generated a lot of buzz without doing any real work. There’s no Surgeon’s photo or Patterson-Gimlin film of this guy, just a bunch of artists’ renderings. And none of those are more than a few years old. It seems like this Ningen thing is strictly a 21st century phenomenon. Not that it really matters. Monsters, of whatever vintage, are pretty much all made up. But with monsters, as with religions, the older ones just seem to have more credibility, more cachet. There’s a momentum and a cultural significance that accrues to a legend as it ages. The Ningen doesn’t have that yet. So, why did I add my artist’s rendering to the growing Ningen pile? Because this is such a cool monster conceptually. How could you not draw a whale man? also, the myth is so psychologically compelling. I want there to be something to this thing, even if I have to make it up. Whale man is a great foil for regular man. In some ways whales are so like us (they have names…maybe), but, cosmetically, they’re about as different as you get without having to deal with bugs. Whale man is relatable, but remote. Also, man and whale man could have any number of interesting dynamics between them. The Ningen could so easily be our victim, a symbol of, and a silent witness to, our wanton cruelty to the natural world. On the other hand, he could be our monstrous tormentor, a “White Whale” of gargantuan size and strength, punishing man for his sins against the sea. Also, the myth is impossible to disprove. For all we know, there could be giant whale people in Antarctica, if only in the way that there could be a million dollars under your floorboards. Anyway, this Ningen’s got everything a good beast needs to succeed: A cool look, an ability to generate pathos and fear, and a giant, unexplored territory in which to purportedly hang its hat. This myth’s gonna be big, and I’m excited to get in on the ground floor. In other news, I’m inching ever closer to the completion of my monster book. All the art is now done (minus a few revisions) and so is about half the writing. Here’s hoping I can get through the rest in a week!